Any time I hear of a dog injuring or killing a child, my heart breaks. As a human, it breaks for the child, who has either been physically and emotionally scarred or taken from this earth far too early. As a mother, it breaks for the child’s family to see their child endure such a trauma. As a veterinary professional, it breaks for the dog. 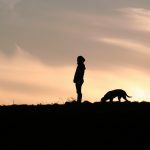 A recent report of two dogs fatally mauling a young boy in Massachusetts has me once again advocating for the dogs, while everyone else is carrying their pitchforks and calling for legislation. The details have not been confirmed, but this little boy had found himself inside of the fenced in area where these two neighborhood dogs were confined. Unfortunately one of the dogs was euthanized, while the second is in custody. As a mother to a young boy, I cannot imagine the heartbreak that his family is going through. I do not negate that a child’s life was tragically and horrifically lost. However let’s take both the dogs and the child out of the picture. A human trespassed onto someone else’s property. If this was an adult, they would be arrested or threatened by the homeowner. Let’s add the dogs back into the story. A human trespassed onto someone else’s property and was attacked by the homeowner’s dogs. In this story the dogs may be considered heroes, simply protecting their owner and their property. Now make the trespasser a child. Suddenly the dogs are murderers, dangerous, and should be euthanized. Their entire breed should be banned. How does this leap happen? How is it that a 7 year old does not know that you need permission to be on someone else’s property? Or that if you don’t know a dog, you shouldn’t approach them without permission? According to Stopthe77.com, roughly 77% of dog bites are from a family or friend’s dog. Which means that 77% of dog bites come from dogs that children KNOW. This tells me that there is a severe lack of education on how children should be interacting with the family pet. If they don’t know how to interact with a dog that their family deems as friendly and tolerant, then how are they expected to know how to approach a strange dog? Watch any montage of “cute” dog and kid videos and you’ll see dogs who give so many signals that they are uncomfortable. The parents and family taking these videos aren’t malicious – they don’t WANT these children hurt. However if they knew how to read their dog’s body language they would put the camera down and intervene. These situations are so easily preventable. As someone who loves dogs, who works with them daily and has taken the time to educate myself on their behavior I urge parents to TEACH their children. Take some of the blame off of the dogs. They only know how to survive and protect themselves. They don’t speak our language and we can’t teach them to. So that puts the responsibility on US to learn how to speak theirs. Stop calling for bans on specific breeds. It’s not the dog’s fault. ANY dog can bite; small dogs, large dogs, lazy dogs, old dogs and young dogs. Should a known aggressive dog who is a true public safety risk be humanely euthanized? Absolutely. Should a whole breed of dogs be banned from knowing what it’s like to be loved, pampered, trained and properly socialized because we’re too selfish and full of ourselves to see past their looks and learn how to communicate? Absolutely not. Maryanne Aldrich is a Veterinary Assistant at PawSteps Veterinary Center in Northbridge, MA. She graduated with an Associates Degree in Animal Care from Becker College and began working at PawSteps in the spring of 2013. She developed an interest in animal behavior early in her career and has continued to improve her understanding of veterinary patients through self-study, consultations with other professionals, and formal continuing education courses . She regularly advises clients about home behavior care and has successfully implemented programs at PawSteps to provide less stressful veterinary experiences. The mother of two tiny humans, and a chocolate lab named Abbie, Maryanne understands the importance of educating clients and their families on how to “read dog” and is passionate about setting new puppy parents up for a lifetime of success.